Z-Day Book 2 is Here! Newly released and on 99c sale this week is A Place Called Hope (Z-Day Book 2) by Daniel Humphreys! But the enemy they thought extinct was evolving - growing faster, stronger, and more cunning. The timely return of the much-depleted 1st Reconnaissance Battalion, US Marine Corps helped turn the tide of one battle. The prospect of renewed war against a different type of enemy will require sterner stuff and serious firepower. Now, they must go far beyond the overgrown wastes they call the wild in a desperate attempt to recover vital military equipment that will determine whether the future of mankind is one for the living - or for the dead. 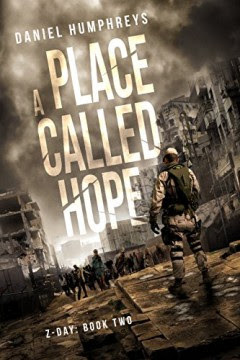 A Place Called Hope is the sequel to A Place Outside The Wild which is also on 99c sale right now! Book 1 is on sale until this Friday, whie Book 2 is on sale until next Wednesday. Grab them both now!